Thanks to all for your trust and enthusiasm! place. Our next move will be to Heaven! SEATTLE May 21, 2013 -- Renfrew Real Estate has been selected for the 2013 Seattle Award in the Real Estate Agents category by the Seattle Award Program. Each year, the Seattle Award Program identifies companies that we believe have achieved exceptional marketing success in their local community and business category. These are local companies that enhance the positive image of small business through service to their customers and our community. These exceptional companies help make the Seattle area a great place to live, work and play. Various sources of information were gathered and analyzed to choose the winners in each category. The 2013 Seattle Award Program focuses on quality, not quantity. Winners are determined based on the information gathered both internally by the Seattle Award Program and data provided by third parties. The Seattle Award Program is an annual awards program honoring the achievements and accomplishments of local businesses throughout the Seattle area. Recognition is given to those companies that have shown the ability to use their best practices and implemented programs to generate competitive advantages and long-term value. The Seattle Award Program was established to recognize the best of local businesses in our community. Our organization works exclusively with local business owners, trade groups, professional associations and other business advertising and marketing groups. Our mission is to recognize the small business community´s contributions to the U.S. economy. Thank you, Arron. Can you tell them I might die if I can't get in there on Friday. I am more than a little excited. I left the HOA meeting feeling very positive. I was very nervous before the meeting because what if a bunch of scuzzie people showed up. Lets face it, the unfinished painting and lack of landscaping could leave one to believe that it had become the Redneck Haven. Fortunately, everyone was really nice and I felt very comfortable. I felt very much at home so what more could I ask for. And they are going to do some planting soon and the painting will be done soon also. I stood on my patio for awhile and I had the sensation of being on the edge of a forest. Very nice... I peeked in windows. Couldn't see much as they left the curtains closed but it sure looked better without all of their stuff. I think there's hope! You'll probably never know how much I appreciate all you have done for me. I couldn't have done it without you. Rest assure I sing your praises every chance I get. Subject: Miss you! Appreciate you! Arron, I SO know I shouldn't be emailing you on a Sunday, but I just want to say I notice you are missing from my daily email life and it's a big absence, because every time we emailed I saw your smiling face and felt your wonderful, helpful energy. We are all so grateful for your superb guidance through this mysterious and improbable adventure, particularly given all we now know was happening in your personal life. Please give big hugs to Angie and Ava for us - Angie will understand why, Ava will just love the love. I know it ain't ovah til it's ovah, but we're a lot more ovah than we were a week ago, thanks to you! SEATTLE August 1, 2012 -- Renfrew Real Estate has been selected for the 2012 Seattle Award in the Real Estate Agents category by the Seattle Award Program. Various sources of information were gathered and analyzed to choose the winners in each category. The 2012 Seattle Award Program focuses on quality, not quantity. Winners are determined based on the information gathered both internally by the Seattle Award Program and data provided by third parties. When I complete purchase of the properties I intend to buy, I will have you to thank. You will have helped me realize my fondest goal, to own and/or rent properties. Without your guidance, expertise, and advice, all of this would not be possible. I know the remoteness of my efforts makes my search more challenging, but it is coming together. When she met you, my sister made some good observations of you and your character, for which I can't thank her enough. I've relied in large part on what she said and carried that with me to today. Again, I can't possibly thank you enough for all you have done to help me. As you know, we signed all the closing documents on FRI.
Now that the dust has settled, Nancy and I want to thank you for all your help through this process. You are a true professional and made what can be a fairly stressful process very manageable for us. I hope our paths will cross in the months and years ahead and I have it on my TO DO List to enter a review for you on YELP in the next week or so. Once again, thanks for your help. We´ll be happy to recommend others to you. I want to thank you for all your help and professional guidance during this process. I find you to be a very easy person to work with in a process that can be more than a little taxing. You also understand real estate and the Seattle/Queen Anne real estate market which has made me feel as if we have been getting sound advice based on solid reasons at every step we´ve taken. I trust your judgment. Stacy wrote: "Arron Renfrew was referred to my husband and I by a close friend and we have been SO pleased ever since. Going into purchasing a home knowing very little, Arron spent several patient hours with us going over all of our options. He allowed us to come to our own conclusions when viewing houses, he made the experience fun with a great sense of humor. Arron will get the job done and then some! I HIGHLY recommend Arron!" Has anyone told you lately that you are an AWESOME Realtor?! Having been on a mission to help home owners avoid foreclosure for over 5 years now, I am grateful to have met you and had an opportunity to work with you, for a mutual client. Thanks for your persistence and relentless pursuit to save one more American from foreclosure! P.S.S. I don't tell you enough that I appreciate all of the behind the scenes work that you have done to help me along as I have struggled with the business. I have to admit that I have not previously held a good opinion of real estate agents before I met you. But, working with you has really swelled my level of respect and appreciation for the industry and, more importantly, you. Arron - I want to thank you for giving us a solid plan outline to help us with our difficult situation. We are enthusiastic about the idea of hosting exchange students and can see that this idea provides some fun opportunities to get exposure to other languages and cultures, as well as play 'host' a bit in our home. - Life Coaching - you could begin to offer guidance to other people in similar situations as we are, helping them look at options to get out of trouble. - In lieu of a fee, many of these same people will be in trouble with their homes & need to understand their options there - you get the listings & expand your "short sale" business that way, perhaps charging a bit extra on commission to cover your services. - Perhaps you'd retain clients for future coaching for fee, or get referrals etc. And I forgot to say CONGRATS on your engagement! Yayayaya! Glad you and Becky got a chance to talk it up. You're easy to reccomend people to because your a rockstar! I have many, many friends still in Seattle. If they ever need an agent, you will be getting phone calls. I have been singing your praises for months. Sir, I can't thank you enough for putting up with my type A personality. You are a terrific man. Arron and I met way back in 2005 when I was exploring getting into a home with Dad's help. That fell through, but Arron was more about helping me find what I wanted than about getting commissions from me. I will utilize him for property purchases in Seattle when it finally is time to make that happen. Arron, Ray is a stellar friend of mine who is looking to be a first-time homebuyer. It looks to me like a win-win relationship! We made the journey across the country from St. Louis Missouri to Seattle. We wanted to work with the Gates Foundation to help feed impoverished people all over the world. Through the funding of the Foundation and my studies of horticulture I am creating plants that can survive, flourish, and feed people living in harsh desert conditions such as exhist in West Africa. We would not be helping so many people without a succssful move to Seattle. Thankfully my wife Kristin and our 3 children Francis, Moses, and George, made the journey, and now call Fremont WA. our Home. "Arron...You are a terrific Real Estate Agent"
Details of the Recommendation: "Arron is a good broker b/c he listens, laughs at all of my jokes and is in the game himself. He is better than all other agents b/c he's got more than just a few rentals. Because of this, he has a style and the experience necessary to communicate with someone who wants a rental empire just like his :)"
Here is the seller signed offer. Let me know if you need anything more from our side. I also need to say thank you. I'm sure you know this, but I want to acknowledge how hard you've worked on keeping this together. I know that it wouldn't be possible without you and the obvious rapport you have with your buyer. Thank you. Thank you buddy, I really appreciate everything Arron, so much, you can't even imagine. Thanks for the info on the money and escrow; we will call JB Ransom and sort it out. The earnest money is available now. And we are fine keeping the offer as it stands with no changes, so we'll have the inspection response back to you later today. oh wow...you even got the emotional rundown! Honestly I'd feel a bit of sellers remorse giving us these terms, too. :-) You were on fire with the negotiations Arron! Thanks Arron, she called me right away and we had a nice chat. I have much to be thankful for -- one item at the top is having you as my Realtor. I really appreciate all your extra efforts. Just wanted to thank you both again for being so great. I really appreciate how quickly you responded when I called you yesterday at the last minute to meet the propane guy. You really make everything so smooth and easy for us, and I know you're working very hard. We feel so lucky to be working with you. Moving day is Wednesday! Wish us luck on moving with a toddler! Arron goes above and beyond to get his clients what they need. From creative brainstorming to getting you in your dream home to finding referrals in the real estate world, Arron has it down. I will not hesitate to go back to him if looking for commercial or personal real estate in the Seattle area." "Arron listened to what I wanted in a house and delivered. I have been happily living in my house for several years and am grateful for all of the time he spent with me during my search and the effort he put forth while completing the purchase!" JJ Greive has endorsed your work as Owner at Renfrew Real Estate. Details of the Recommendation: "Aaron is a committed Real Estate agent and a Real Estate investor. He is not afraid to roll up his sleeves to get a job done. He is willing to share his extensive knowledge with others and has been a guest speaker at real estate investment meetings. Aaron takes his business seriously and loves his work and it shows. These are just some of the qualities that make Arron a top notch real estate professional." Marilyn Rice has endorsed your work as Owner at Renfrew Real Estate . Details of the Recommendation: "Whenever someone asks me if I know a good real estate agent, I always recommend Arron. What makes him stand out from the crowd is he spends the upfront time with you to find out your long and short term goals; he provides a realistic view of the market; he takes you to properties that you stated you wanted to see in your goals session; he gives you options. I never felt like Arron was just trying to make the sale. He gave guidance throughout the process. Then when I found the property that I wanted to buy, he helped by providing great people with that part of the process. I will use Arron as my agent again and I will continue recommending him to my friends and colleagues." Click Here to See some of Arron's Clients building from the ground up! It is my distinct pleasure to write this letter on behalf of Arron Renfrew, whom I met in 1999 when I was looking to buy my first home. I could not find an agent that I clicked with or trusted. The process was frustrating and I was about to give up when Arron came to the rescue. I was confident working with him because he knew what he was talking about. He is a self made man who is well versed in all angles of the housing industry . He truly has his client's fiduciary interest at heart. I was so inspired by his hard work and success that I bought two houses in one year. The second house is a rental property which I will be selling within the next year, and use the profit to pay off my primary residence. I don't know many single females at the age of forty-two who can pay off a house in the heart of Ballard. 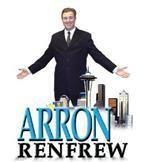 I feel comfortable recommending Arron as a One Stop Real Estate Shop. A business partnership with Arron will consistently produce positive results for all parties. Thanks for everything, Arron. You've done a great job! I can just drop the check by your office today. I'll be meeting with the city about the property early next week, and plan to have the property appraised also. I expect I'll use up 10 days or so by the time I get everything covered. Thanks for helping me make this happen Arron! You have a great website with a lot of information and it is presented very well. One of the best I have seen. Thank you so much for all your hard work to get me my dream house. You really did go above and beyond. If I learn of anyone buying/selling, I will gleefully refer them to you. Sincere thanks also for sticking around so long this evening so that I could benefit from your brilliant insights, especially since you weren't feeling well. I hope you feel better soon. You had mentioned that you know some contractors and other construction type people. Could you send me some names of those you would recommend? Thanks so much. Oh......Thank you also for the donation check from the UD house purchase. I can't tell you how helpful this is to the Order. I will send you an acknowledgement asap. Oh, Arron Thank you, Thank you so much for what you did. You had to put up with and deal with so much to make this happen! You kept things together even through all the B.S. Wow...We love our new home!! We are so Grateful for how you handled the sale of our home and coordinated the purchase of our new one so that everything happened so seemlessly. Arron, Thank you very much. We are Eternally Grateful.. This was all so stressful! But knowing you were there and looking out for our best interests (and keeping on top of everything) certainly helped us! All your time and assistance are greatly appreciated. Thank you again for all of your help in getting us out of our old house and into our new one. It was a great relief knowing your were there working to keep all of those other "professionals" on task!! Please accept these tickets with our most sincere gratitude. Thanks again so much for all the work you've done for us - this year of change and adventure (& fortune?!) could never have been possible without your help & advice. Hope you had a wonderful 4th! We'll get togehter for a reunion once summer settles. Working with you has meant a lot to me because of your DEDICATION your UNDERSTANDING and your FRIENDSHIP. Working with you is something I'm going to miss and that I'll always remember WITH GRATITUDE. Amazing! What a crazy trip this has been - sure glad we took it with you guys! I couldn't ask for a more pro team to work with on a project like this. Dorrinda and I are looking forward to making some new investments next year, so we'll get to do this a few more times, heh. You are a terrific real estate agent. You were extremely helpful and patient and understanding and hard-working during our house-hunting expeditions. You were always kind to our kids and nice and terrifically enjoyable company. You were always flexible and available to help at any time. You are really an expert in real estate and you know the North Seattle area particularly well. Your advice and guidance were never forceful, but always helpful and very welcome and wise. You answered each and every one of our many questions. You introduced me to an excellent mortgage broker and a very thorough inspector. I will recommend you highly to anyone else I meet who is looking to buy a house or condo in Seattle. Thank you so much, Arron, for helping my family find and purchase a great home in Fremont. Once the furniture arrives, we will call and invite you over for a drink and a toast. absolutely earned our ongoing referrals! Thanks again - we'll have to get together & share a toast to this one!